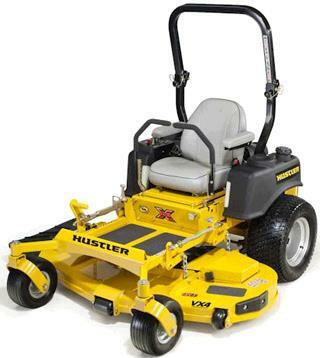 New generation Hustler X1 zero turn mower. Dependable 23.5 hp. FX730 Kawasaki engine. 54" side-discharge deck with rubber chute. 18,340 fpm blade-tip speed for superior cut. 10.3 gallon fuel capacity with fuel guage. Dual HydroGear pumps and high-torque wheel motors for long trouble-free service. Lifetime warranty on mower frame and leading edge of deck. Simple maintenance, easy access to service points. ROPS and hour meter are standard.